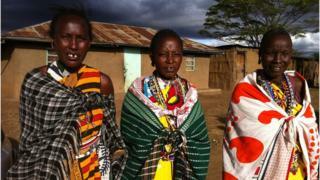 Last month a controversial bill legalising polygamy became law in Kenya. Yalda Hakim reports for BBC Our World on how it is being received. In the chilly dawn deep in Kenya's Rift Valley, three women make domestic preparations for the day. One cooks breakfast, another makes pancakes, the third fetches milk for tea. But Alice, 62, Mary, 56, and Joyce, 54, are doing this for the same man, the husband to whom all three are married. He is Isaya Ntokot, a 76-year-old with 15 children and 48 grandchildren. There is nothing unusual about this - in fact, three wives for a wealthy man like Mr Ntokot is considered not at all excessive, and unless you are Muslim, Kenyan men can marry as many women as they like. The Maasai accept polygamy as a way of life and these women grew up with fathers who had married several wives. They all expected that one day they too would become part of a group of women who would share one man. The three wives claim to live harmoniously, though Alice, as the first wife, feels she has more authority than the others. "I advise them on what to do," she says. "Because we are friends, it's easy. It would be harder if we didn't get on so well. If I disagree with them on something, I just try and stay calm." These women had little choice but to enter into "customary" marriages rather than having civil or church weddings. Before the new act was passed, they lacked legal protection because customary marriages were rarely registered and therefore not recognised in a court of law. This left many women vulnerable. If a husband died, they could be disinherited, and their children risked losing their rights and legitimacy. Now a customary marriage will be treated as equal to Muslim, Christian, Hindu and civil ones, giving all wives legal recognition and rights. Women's rights groups have hailed this aspect of the law. What they find absolutely unacceptable is that male parliamentarians used their majority to vote down a clause requiring a man to inform any existing wives of his intention to marry again. "When you marry an African woman she must know the second one is on the way, the third one is on the way, the fourth one is on the way". "This is Africa Mr Speaker. We are not living in Europe, we are not living in America." Female deputies stormed out in protest. Wanjiku Muhia, one of just 69 out of 349 women MPs, is in a customary marriage herself and voted for the bill because of the protection it offers. But she also says it is sending out the wrong message. "I'm very disappointed as a woman, and this law has taken Kenyan women back to the 18th Century, or thereabouts," she says. She is not disputing the idea that "African culture is polygamous," she says, "but we are finding it disrespectful that some [men] can just bring another woman without informing the first wife". How would a 45-year-old woman compete with a 19-year-old girl in all matters, and in the bedroom? Ms Muhia says she would leave if her husband brought home another woman, and that many others would do the same. "Where are we heading, we are going to have many divorces," she says. Some men clearly feel threatened by such talk. Nderitu Njoka, who runs a men's empowerment group, says Kenyan men often suffer economic, legal and even physical abuse at the hands of women - and he defends polygamy. "If your first or second wife doesn't respect you as a man - does not care for you, cook for you, do all those things that she's supposed to do, then you're not supposed to just stay there and live a stressful life." In Nairobi's vast Kibera slum, Maurice Adongo splits his time between his two wives. They live in separate houses, less than five minutes away from each other. He married Bridget, wife number two, 11 years into his marriage with Veronica. He thinks it's a perfect arrangement, but Veronica disagrees. "I feel like I have been dumped," she says. "Some things a couple should sit down and talk about, but when your partner thinks bringing another woman into the relationship is the answer, and you disagree, it's not going to work." The worst part for Veronica was that Maurice didn't tell her. She found out from neighbours and says she was heartbroken. Maurice would not have been able to take a second wife if his marriage with Veronica had been a church or civil wedding. Yet church or civil weddings can be very expensive in Kenya, so many opt for traditional ones. Activists are now trying to educate people about the difference between customary and civil marriage. They're also looking for ways to make civil marriages - under which polygamy is not allowed - easier. The new law, however, means polygamy is likely to become more entrenched. That is a concern for Christian leaders like Robert Burale, who says lawmakers are encouraging promiscuity and the end of the nuclear family. "Imagine a man's first wife is 45 years old and he brings in a 19-year-old girl, how would a 45-year-old woman compete with a 19-year-old girl in all matters, and in the bedroom?" he asks. "These women will also look for younger men. And then you start seeing men in the streets fighting." Even in the Rift Valley, where the practice is deeply embedded, polygamy has its opponents. "I don't think it's right at all, no matter what they say," says Maasai community worker Joyce Kiereini. "I'm sure that they know it's not correct, but it's because of being selfish men they want to continue running around with other women."